Easy 5/5. However, as a warning, this show is unfinished and it appears like it will remain that way. If you can't bare the fact that the show doesn't have an actual ending then please avoid it or you will be left with a very large hole to fill just like me. TLDR. 5/5 but doesn't have an ending and seemingly won't ever have one. Decent anime, very much a vein Battle Royale. Characters are written well enough, and I find myself caring for the main ones. If you are a fan of violent animes, this one will do just fine. Don't expect anything to deep. Once show is over, you will definitely want more, but other than that, it won't really stick with you all that long. 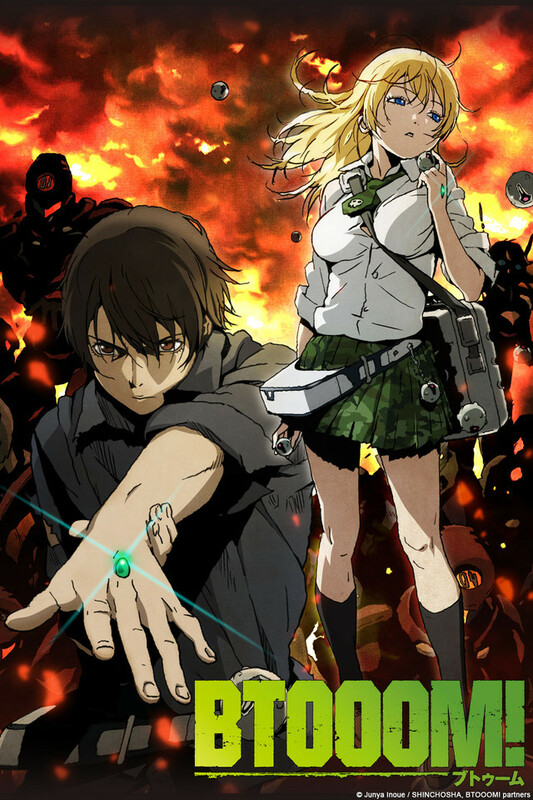 If you like survival anime taking place in videogames/simulations, you will like BTOOOM! Although it's based on a concept already done numerous times, the mechanics that it uses separate it from the rest in interesting ways. 30 survivalists are abducted and taken into an island with no resources save for the ocasional air drop. To fight they use a variety of bombs, Some are straightforward but can be used in creative ways while others are more complex. They are also equipped with a radar (a gem in their hands). The anime does a good job with its action scenes. It showcases how the survivalists must used their bombs and radar in well thought-out ways to kill their opponents, with the goal to gather 8 gems to escape the real life game. It's not a simple throw the bomb and easily kill your target, confrontations have a chess like element to them. The plot, character development and story pace are well done (for a twelve episode series). BTOOOM! has mature and grittier themes, which are expected since survivalists are trapped on an island being forced to kill each other for the chance of escaping alive. It pushes their sanity to the limit which in turn causes them to commit despicable acts, especially towards the women. The anime showcases all of this well so you might feel uncomfortable. I recommend anyone to give this anime a try, it's good. The anime ends abruptly (cliffhanger). After consulting the BTOOOM! wiki, it appears this anime was finished (around 2012) without much source material from the manga. Although the anime was successful internationally, both it and the manga struggled to meet expectations in Japan. Which means a second season is unlikely, after all, it's been five years and no word of it has come out. However, the manga continued and released its final chapter in 2018. Now there will be a spin off anime of this series that will serve as a prequel/prolougue. Maybe the manga has the answers we need to conclude the anime? I haven't read it. #246. "Game" of guerrilla warfare. BTOOOM! is a battle royale style anime with an objective, collect eight crystals (including your own) from other opponents, and you may leave the island. With a wide range of technologically advanced grenades at every fighter's disposal, our main characters must fight for survival to escape this brutal death game and return home. Unaware that people they know are the reason they were sent to the island to begin with. The anime does guerrilla warfare pretty well, due to the fact that the main means of combat is through grenades, guerrilla warfare is pretty much the best option. The characters also give me a huge Death Note vibe, which shouldn't be too surprising since it is animated by the same studio, Madhouse. While this anime was very good, it leaves off on a cliffhanger that could be most accurately described as the halfway point. Since the anime was also made back in 2012, and along with some other behind the scenes issues, a second season in my opinion is highly unlikely. Regardless of the massive cliffhanger ending, what is here is still very good. BTOOOM I must admit I only first watched this for a joke thinking with a title like that they cant be taking themselves seriously. Man was I wrong, the action in this anime is actually pretty good and the concept while done before was still interesting to see executed. Member 1 - Rated 5 out of 5 stars. Overall rating: 3.8 out of 5 stars. Club chose to move on to the next series on list rather than watch the second episode. The end of the first season leaves off on a cliff hanger and literally states that is is not decided if there is a second season. Five years after its original run, there is still no second season. If the studio had decided to end the story at the end of the first season, it is likely that the show would be better. Ignoring the feeling of it being unfinished, the series itself is not good. Don't get me wrong, it does address serious topics such as the human psych and how people react in certain situations, but the rest of the show feels like it exists for tension. Most of the backstory given is unneeded and feels like it's put in just to fill the series with more useless plot devices. The scenarios that play out are overly cliched and any viewer would be able to predict the next thing that will happen. Overall, it is honestly better that this did not get a second season. I was drawn in by the interesting plot and visuals...got way more than I expected! This show definitely deserves more recognition than it has gotten and definitely a second season. It has a little bit of everything: action, gore, romance, and psychological thrills all packed into 12 episodes. I thought I was hard to shock, but I found myself with my jaw on the floor plenty of times. Would definitely recommend giving it a watch!